Notes And Updates: Since more and more SUV's and pickups are being towed the "Drop" Receiver is often reversed and becomes a "Rise" Receiver. The term "Hi-Lo" receiver is becoming the term for this part. Most RVers tow a vehicle or trailer behind their motorhome. With more and more vehicles being approved for flat towing and many inexperienced RVers deciding to flat tow for the first time, I am seeing many more incorrect or even unsafe towing situations. Before buying and preparing to set up a towed vehicle, ensure that you know what is required to correctly tow the vehicle you have selected. We recommend towing vehicles approved by their maker for flat towing. Review the owner's manual under recreational vehicle towing to become familiar with the exact requirements for towing. Some require disconnecting the battery, others require a fuse to be removed (check out our RVing FuseSwitch™) and others do not require any special procedures. Once you have selected the tow vehicle the following information will assist you in preparing to flat tow the vehicle. There are three general areas that I focus on for flat towing: the tow bar setup, the tow vehicle wiring and braking systems (or lack thereof). In a subsequent article I'll discuss some of the issues with trailer towing. Most RVers select a motorhome mounted tow bar so that when they disconnect the vehicle, the tow bar remains stored on the RV. These tow bars have adjustable arms so that the process of connecting and disconnecting the tow car can be done by one person. The tow vehicle does not need to be exactly centered behind the RV nor exactly the right distance away from the rear of the RV. The adjustable arm style of tow bar greatly enhances the convenience of towing a vehicle. Some tow bars can be stowed on the front of the tow vehicle however pedestrian safety and bumper height laws signal the demise of this style of tow bar. Frankly in my opinion the tow vehicle also looks better when the tow bar is not on the front of the vehicle. As an aside, many state laws require that the extra apparatus required to tow the vehicle be removed when you are driving the tow car. Do I need a Drop / Riser Receiver? In many tow vehicle configurations, the answer is yes. Ideally, the tow bar should be level; if it is not, then the RV end of the tow bar should be less than 4" (10cm) higher than the tow car end. The tow bar is designed to safely tow the vehicle when it is level. As the rear of the RV rises and falls while going down the road, the rear overhang of the RV will accentuate any vertical movement. In one vertical direction of the coach, the tow vehicle is drawn closer to the RV, in the opposite direction; the tow vehicle is forced backwards. This action places stress on the tow system and tow vehicle and can cause unusual tire wear or other situations if the tolerance is exceeded. A Drop / Riser receiver will correct for the height differential. To determine what size is required, measure from the ground to the center of the tow tab position on the tow vehicle and record this dimension. 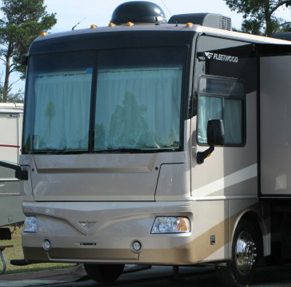 Ensure that the RV is level and the air suspension is fully "aired up" and at driving height. Measure from the center of the hitch receiver hole to the ground and record this dimension then compare it to the previous one. Drop / Riser Receivers are the same component and the correct term depends whether they are installed so the tow bar is above the RV hitch receiver (riser) or below (drop). They are usually sold in 2" (5cm) multiples and choosing the correct one will bring the height differential to within the 4" (10cm) tolerance. Recently, versions in 3" (7.6cm) or 7" (18cm) were introduced and are rated to carry higher weight vehicles. For safe towing, ensure that the Drop / Riser Receiver is rated at, or above the towing capacity required. Towing safely requires highly visible tail, brake and signal lights together with control and knowledge of the tow vehicle braking system. Dependable lighting requires full power to the rear lights on the tow vehicle. The items to be concerned with, are the type of connectors, the size, type and length of the wiring and the method of operating the lighting in the towed vehicle. The weakest link in the wiring will affect all lighting functions. We recommend using a six wire coiled extension cable with round connectors between the RV and Tow Vehicle. Secured receptacles to accept these connectors mounted on both the RV and Tow Vehicle are the best way to ensure full power. These connectors lock the wiring into place, have large pins, are covered when not in use and the wiring does not suffer from the abuse that coiling and uncoiling loose wiring each time the towed vehicle is towed. Many newer RVs come equipped with a seven pin, blade style, trailer type connector which includes connections for left and right turn signals, taillight/marker lights, brake lights, a ground, a trailer/tow brake wire and often a charge connection. This style of connector requires a simple plug-in adapter to accept the six wire cable extension. On older and small RVs, the tow vehicle connector wiring is directly connected to the RV wiring. There is some voltage loss, however with clean connections and the shorter distance that power must travel, tow vehicle lights operate correctly. On larger RVs, the tow vehicle/trailer wiring is controlled through relays so that full power is delivered to the tow vehicle. When you realize that the wiring circuits can be forty to forty-five feet long on both ground and power side in the RV plus up to twenty feet on both sides in the tow vehicle, you quickly understand that loss of power travelling over a 100' (32m) circuit is likely even with good clean connections. Relays reduce the wire length and ensure full power to the RV connector. Some Tow Vehicles require that the lighting system be powered by the RV through a diode package. There is some loss of power through the diode block; we recommend a high quality diode kit together with sixteen gauge (16ga.) wiring from the front to the back of the tow vehicle. At the present time, the vast majority of tow vehicles have taillight housings that accept the installation of an additional bulb, which is powered exclusively by the RV. This eliminates any potential interference between the RV and the tow vehicle wiring and potential damage to the vehicle's computerized monitoring system. As more tow vehicles transition to LED taillights, the tow vehicle wiring will require tow vehicle connections through a diode block. The safest wiring installation from front to back in the tow vehicle is to run the flat, four wire, 16 gauge wiring supplied with the wiring kits, from the front of the tow vehicle, along the driver's side fender area under the hood, through the large wiring grommet in this area into the passenger compartment and along the driver's side door sill plates to the back driver's side of the tow vehicle. The plastic sill plates can be removed by placing your fingers under the carpet side of the plate and pulling straight upwards. Once the plates are off, a track or raceway for vehicle wiring will be exposed along the driver's side of the vehicle and the tow vehicle wiring can be run alongside. The industry standard color coding of this wiring is as follows: White: Ground; Brown: Taillight / marker lights; Yellow: Left turn signal and brake; Green: Right turn signal and brake. Molded into the plastic surrounding the pins on each connector, is the wiring information. Simply loosen the screw on the appropriate pin and insert the stripped wire end into the pin and tighten the screw. Doing this on both the tow vehicle (and RV, if required) ensures that you will be consistent with industry standards. We recommend spraying the pins on both sides with Corrosion Block™ and making a ground connection from the white tow vehicle wiring in the front fender area to the tow vehicle body. The most common question we receive when helping a RVer set up his tow vehicle is: Do I need a Tow Vehicle Braking System? The short answer is: Yes! All chassis makers set standards that specify if towing more than 1500lbs.(682kg. ), then the trailer requires brakes. While some try to hide behind the various state or provincial laws, the one law that overrides all of these is the Newton's first law of motion. The tow vehicle will increase the stopping distance of the RV, especially in an emergency. The brakes on the RV cannot be expected to stop the tow vehicle and RV in the same distance as the RV alone. Our book "All the Stuff You Need to Know About RVing" contains an excellent summary of the tow vehicle braking systems available and the questions to ask when doing your investigation of the various systems. The safety and peace of mind knowing that you are travelling safe is worth the initial cost of the tow vehicle braking system. Ensure you have a monitor in the coach of the system operation and that you have a breakaway system. As unlikely as it seems, a towed vehicle can break away, and keeping it under control is crucial to an uneventful outcome. The extra wire in the extension cable and tow vehicle wiring allows the information to be transferred from the Tow Vehicle to the RV so you can monitor the brake system. If you have specific questions contact me directly.